Jill Of All Trades: Winter skin care for the li'l one with Himalaya Baby Lotion. Winter skin care for the li'l one with Himalaya Baby Lotion. Winters are here, and though we love this season, it’s not a baby’s favorite season in particular. Their skin is many times more sensitive and delicate than ours, and if your skin get’s dry during these months, just imagine how badly it would affect your infant or toddler. 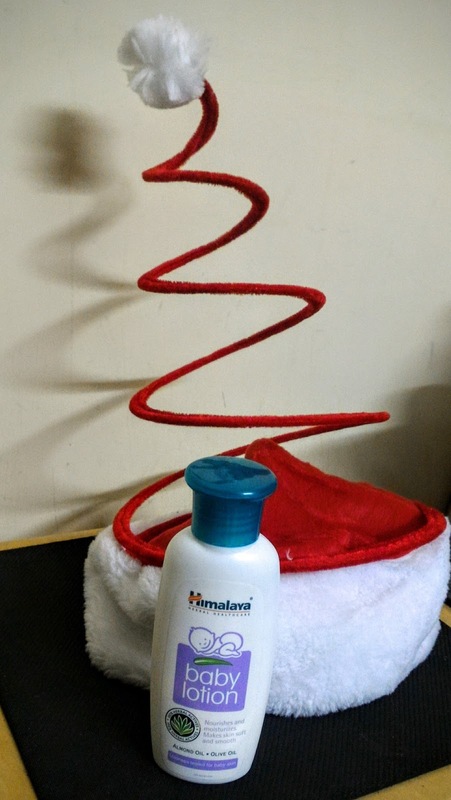 You must have definitely read my other blogs where I’ve reviewed Himalaya products, and I thought now that it’s winter, I must talk about the Himalaya Baby Lotion. Himalaya’s Baby Lotion helps keep baby's skin soft and supple, protecting it from infection. Baby Lotion is made from natural ingredients that help moisturize delicate skin, leaving it soft all day long. It is clinically proven to be mild and gentle enough for newborns as well. Apply Baby Lotion liberally on baby's body after bathing. As mentioned on the directions, I lather my kiddo up just after he’s had his bath, as the skin tends to start getting dry immediately after that, so when you apply the lotion then, skin tends to remain moisturized throughout the day. It does not have a over-powering smell that some other lotions tend too, nor is it too greasy or oily, that would be risky if the baby slipped because of greasy feet or knees. It absorbs in the skin quickly, and just like every other Himalaya product, is made of natural ingredients that our very good for skin- like Olive Oil, Almond Oil and Licorice. Another tip here: we think we should use really hot water for bathing during winters and you might up the temperature a notch when you're preparing the water for your baby's bath, but it's a total No-No. Very hot water strips the moisture off the skin, so stick to lukewarm to little hot water even on those chilly winter days! What I also do is, apply it at night before the baby is put to bed, when I’m making him wear the diaper and pajamas. Because it tends to get really cold at night and early mornings, so I feel it’s required again. If you buy multiple quantities , you can even avail discounts from the Himalaya online store, so if you want to stock up, or if you can buy along with other mommies, that’s a great idea too! Happy winters and Merry Christmas to you'll! IskiUski is one of the online foremost jewellery shop in india with the latest jewellery design in Gold, Diamond, Silver. We offer wide range of buy online gold jewellery from various famous designers. vastu tips for south facing house entrance advises that any property with entrance facing towards the south western direction must be completely avoided as this is the direction of devil energy, which brings misfortune. In a country like India, vastushastra is considered one of the basic requirements while constructing a property or building according to pre-specified principles. It is necessary to follow these principles for wealth, health, fame and prosperity in life. Though it has become difficult to follow each and every principle in the present era, it is important to make maximum use of tenets in order to achieve peace and harmony in life.